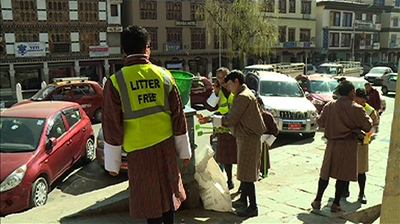 More than 100 building owners across Norzin and Changlam area were penalised by the Thimphu Thromde yesterday for poor waste management in their areas. During a surprise inspection, thromde officials collected more than Nu 100,000 as fine for not following rules and regulations. According to Waste Prevention and Management Regulation 2012, littering, dumping, smearing of lime and display of posters are not allowed in public places. Most building owners paid a fine of Nu 100 for littering. Some house owners were however asked to pay Nu 20,000 for dumping waste into prohibited areas. Thromde officials also inspected drainage system, fencing and flooring in the town. Officials will be strictly monitoring the whole city to manage and prevent waste. Good job … Well done… Keep up the Sprite and consistency… Angry dog will bark but work should go on… It should be regular check not just surprise check and give some bonus to those inspectors who brave harsh words and insults from litter bugs.. It’s high time for action.. Too much talking has been done … Really appreciated for pulling socks up and putting boots on & folding the sleeves up for real action. In most clean countries or rather developed countries, cleaning is a business and thousands of Bhutanese are doing cleaning job abroad.. Every one is aware which country I am talking about.Now with strict waste management rules in place cleaning can be real business. Bhutan doesn’t have one cleaning company as a country. How do we expect someone to clean our streets, toilets , ect every time by volunteers. It will create jobs for hundreds of youths..
when you pay for parking car which doesn’t dirt the road then why not pay for cleaning waste or litter which brings disease , spoil image as tourist destination( our main source of income)..Honestly its going going to create jobs…..